After 90 degree temps last week, today we woke up to a cool, crisp 60 degrees! Finally a taste of fall! It definitely put me in the mood to start my fall decorating. I made a new wreath for the front door and did up a basket for the front of the house !I’ve put together some inspiration to get our fall decor ideas flowing! I put this wreath together this morning. Would you believe all of the floral and berry elements are from the Dollar Store?? The grapevine wreath was a flea market purchase. I selected two types of berries and three types of flowers. They generally come five flowers (or berry bunches) to a bunch and I used three bunches of each type of flower for BOTH of the projects. I I cut the stems apart at the base (the thickest part of the bunch stem). Then I start to play. For the wreath I simply stick them in where I want and then hot glue them in place. For the basket, I stuff it with floral foam and insert my flowers and berries. Super simple. Make a burlap bow and it’s ready to hang! The basket was another flea market find- $2. The flowers were what was left over from the wreath above! The only cost was the 3 blocks of floral foam that I filled the basket with which I had on hand! Both projects came to a total of less than $20! Here are inspiring fall projects from some of my very talented blogging friends! Shannon’s Neutral Fall Home Tour shows you how to decorate for the season using neutral colors. Her home (and blog) are a gorgeous mix of rustic and farmhouse. I’m totally in love with this mantle display! How sweet and simple is Barb’s little pumpkin in a rope wrapped flower pot! Add a name tag and you have a place marker! It’s part of her 10 minute Fall Tablescape projects. Jamie from Anderson and Grant has put together this lovely centerpiece with gourds and leaves in shades of green and white. If you like monochromatic, this is for you! If you like a more colorful option, it would look beautiful with leaves in brilliant fall colors and a variety of colored pumpkins and gourds. The wood bowl really sets the fall mood. Jane did a beautiful burnished mantle, but this little apple basked painted white and filled with all this burnished goodness is what caught my eye. Metallics are very popular and aren’t limited to metals items. Take a look at these pumpkins that Angie painted. She has tons of quick and easy projects on her site. Laura and Dana at Finding Home Farms updated an already gorgeous spring display with fall goodness! I didn’t think the spring display could get prettier, but the fall display is – well, just look! Plates, gourds, and gorgeous greens all in galvanized tubes and an old door! KariAnne from Thistlewood has so many gorgeous fall decorating ideas I would have copied her entire blog and pasted it here, but you’ll just have to click and see for yourself! Don’t miss her chenille pumpkins! If you know anything about Gina, you know that aqua is her color and she doesn’t disappoint with this beautiful tablescape for fall. 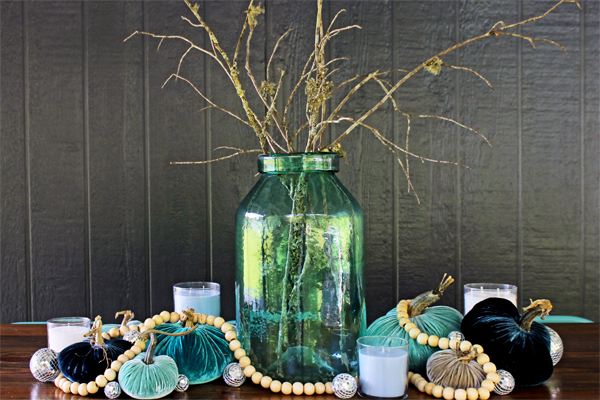 Velvet pumpkins in aqua and varying shades of teal offset a beautiful colored glass container. Add some bling and candles to make a really striking table or mantle display! I am slightly obsessed with this vignette, seriously, I want to crawl into the photo and live with that big old wooden door with the wreath on it and that pretty little sugar mold! Baskets, pine cones, greens, berries and oranges with cloves! How gorgeous is this for your Thanksgiving table! This front porch!!! Crates and bottles and a lantern!! I love the chalkboard and pine cone garland! What’s your favorite element? My good friend Barb also made this awesome burlap and galvanized letter “Gather” sign for Fall- but it can be used all year long-no painting required! She shows you how! Suzy has styled her dining room to perfection for fall with this antique shelf, pumpkins, lantern, and wreath and much more! Debbie from Refresh Restyle did this lovely centerpiece using cotton bolls and a sugar mold, candles and pumpkins! Tasha had a great idea creating a chalkboard wall, she can change the decor with the seasons. Its a simple project with a huge payoff! I hope you enjoyed these project and use some of them in your home. Thanks to my bloggy friends for allowing me to share these beautiful projects with you! The post Fall Decor Ideas was written by Karen Ploransky and is the property of The Decorated Nest. If do-it-youself isn’t your cup of tea, here are some fall decor ideas for you! Thanks so much, Karen, for featuring our porch! xoxoxo Love all the wonderful inspiration! Thank you for being on the list of bloggers that wanted to share in roundups. I loved your porch and was honored to share it. So many beautiful projects out there it was hard to choose. Thanks again! Really great roundup, Karen! Thank you for including my fall dining room. How could I not, it’s gorgeous, thank You!